The educational medium of first-person interpretation is honed to an art form within the roleplaying program at Mystic Seaport. Based in the country’s centennial year of 1876, the research performed by each staff member over the course of nearly a year becomes an individual composite profile. 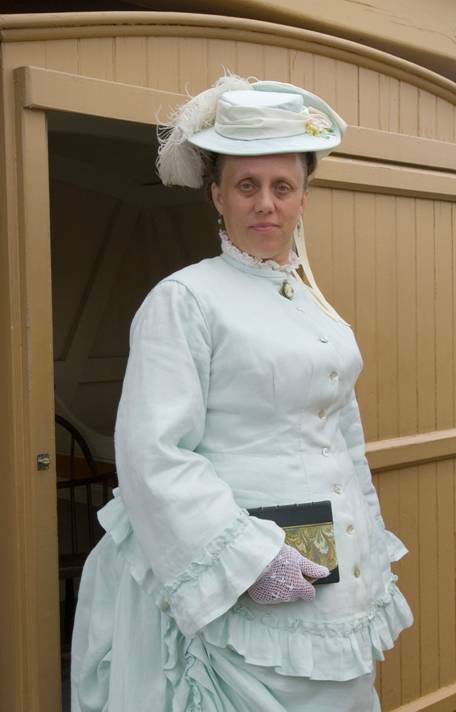 The Museum’s Costume Shop then uses this profile to build a historically accurate wardrobe for each character, whether that be a whaling captain’s wife or a steamboat oiler. 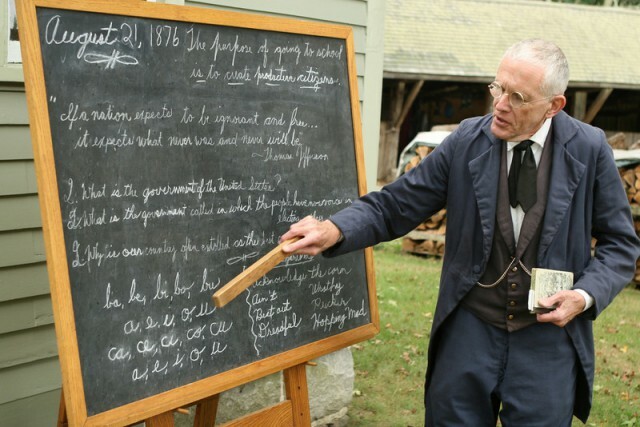 In addition to their daily work on Museum grounds, roleplayers are used in outreach presentations to schools and historical societies, overnight programs with scouts and elderhostels, and special events such as Decoration Day and Independence Day. Whenever encountered, the roleplayers share historical facts melded with historical perspectives to create an experience with the past that can only be had face-to-face. Mrs. Ann Owen Williams hails from Wales, a harsh stretch of shoreline on the westernmost edge of the British Isles. She and her husband, master of the cargo vessel Cambrian Monarch, are briefly visiting America as the young country celebrates its hundredth birthday. A lady of poise and elegance, she also cares deeply about her husband’s crew and others less fortunate than she. Ask Mrs. Williams about music, temperance, or sister sailor Mrs. Capt. Wheldon! Mrs. Ellen Ashby Wheldon first called her father’s whaleship Albion home. Although she prefers dry land, her blue water childhood gave her the courage to accompany her husband, master of the whaler Shepherdess, and to raise three children at sea. Now she and her husband own a store in Mystic, where she is content to remember the Sandwich Islands from afar. Ask Mrs. Wheldon about her journal, the seven-times table, or fellow seafarer Captain Nelson! Captain Thomas Nelson hails from Cape Cod, where his family has long resided. In his rise from foremast-hand to master, he’s hunted the great whales and brought Chinese silks and Irish immigrants alike to American shores. Now having “buried the anchor,” he hopes to visit his Mystic family and explore the country he has mainly glimpsed from the water. 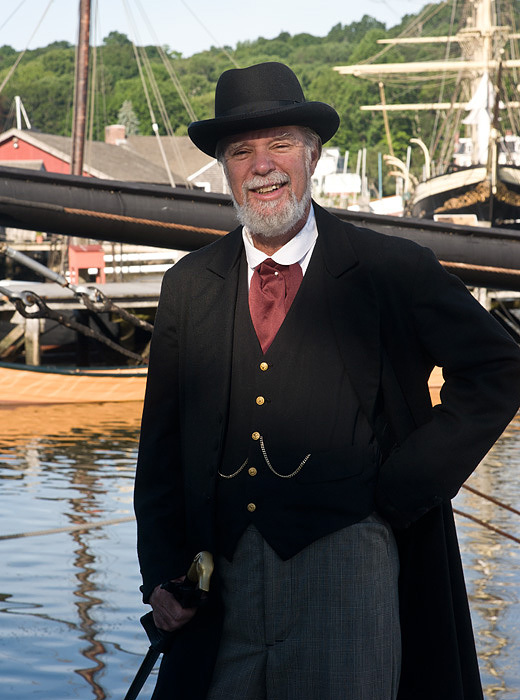 Ask Captain Nelson about his Italian adventure, his daughter’s island name, or steamboat oiler Mr. Carter! Miss Louisa Elisabeth Ackerman hopes and keeps busy managing the Ackerman Boardinghouse by day and pursuing her dreams at her writing desk by night. She and her mother moved here from Gettysburg in 1863 to join her brothers, shipwrights at the Greenman and Mallory yards. Independent and “strong-minded,” she nevertheless possesses a fondness for Romanticism and a weakness for fashion. Ask Miss Ackerman about the Stowe family, base ball, or kindred knitter Mrs. Rathbun! Mrs. Lydia Wyer Rathbun was born into an old Nantucket island family and grew up while her father was whaling on the Charles W. Morgan. She learned telegraphy when her fisherman husband joined the Union army, a skill that later helped her survive in her widowhood. Always happy to meet new people, Mrs. Rathbun now manages Mystic’s elegant Hoxie House hotel. Ask Mrs. Rathbun about her squirrel, the steamship Metis, or sister widow Mrs. Buckley! Mrs. Emma Babcock Buckley learned herbology from a native woman who lived near the Babcock farm. Her superior knowledge of cookery and herbal remedies is locally famous! After her husband’s death in 1871, she went to the Stonington Almshouse but now resides with a family in Mystic. She is a cheerful, incurable gossip who won’t hesitate to share her opinions. Ask Mrs. Buckley about washday, the city of New London, or Mr. Avery’s sweet tooth! Mr. David Avery was raised by English parents who endured both immigration and the War of 1812. Now, he teaches the children of Greenmanville about Centennial patriotism and being a good American citizen. 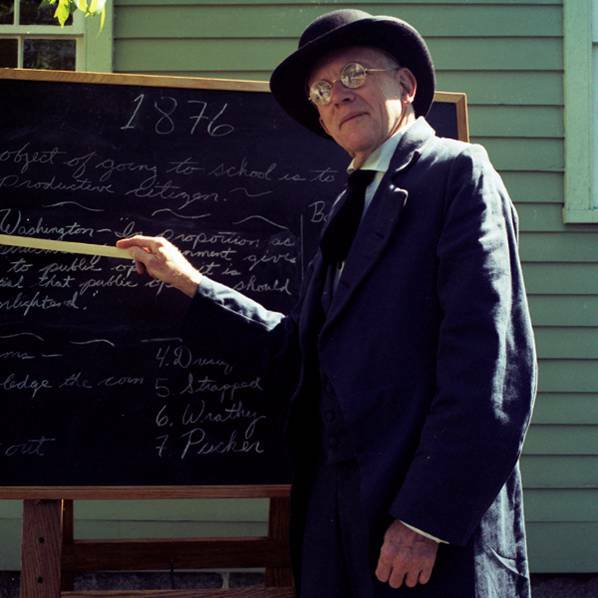 Found most often at the little green schoolhouse, he is always willing to help others with his renowned alphabet drill or warn them against the use of slang. Ask Mr. Avery about his whaling days, the ferrule, or Italian immigrant Signora Panesi! Mrs. Maria Paolina Panesi has been shaking up New London since 1854 as one of its few Italian immigrants. Devoted to her family and stonemason husband, she is just as interested in America’s opportunities as she is in preserving her Tuscan traditions. 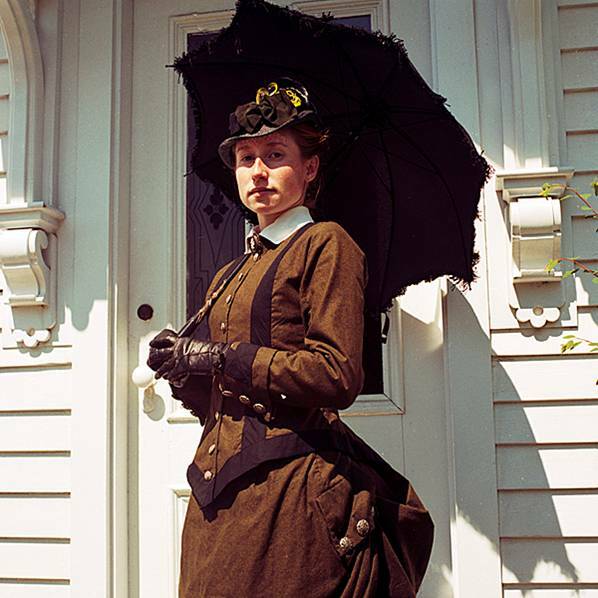 Although her ways and those of her New England neighbors often differ, her lively sense of humour usually prevails. 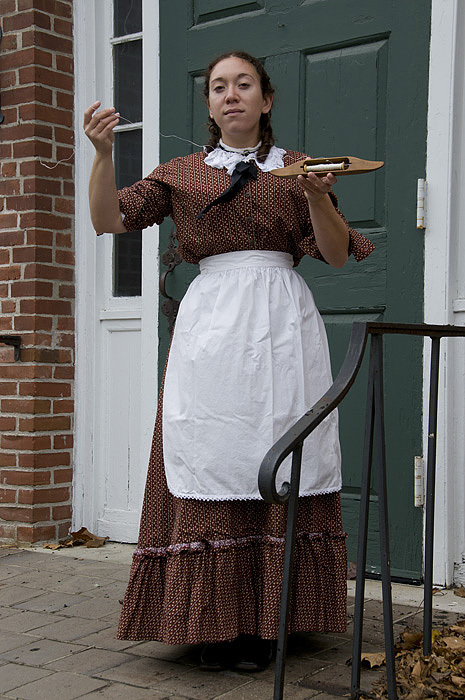 Ask Signora Panesi about her daughter’s doll, independence fighter Garibaldi, or soprano Miss Marsh! Miss Elizabeth “Bess” Marsh enjoyed a music-filled childhood, so she happily attended the prestigious Music Vale Seminary. After her parents’ death, however, she and her sister came to Greenmanville, where she found work on the woolen mill’s spinning floor. She is often heard practicing for Singing Society concerts in the Reading Room or on the way to the Lyceum. Ask Miss Marsh about the labor laws, her Irish beau, or fellow Seventh-Day Baptist Mr. Maxson! Mr. Elias Thomas Maxson may be more comfortable addressing a heap of lumber than a bevy of society ladies, but his mild demeanor and hearty laugh are as well-known throughout Mystic as his occasional Saturday sermons. 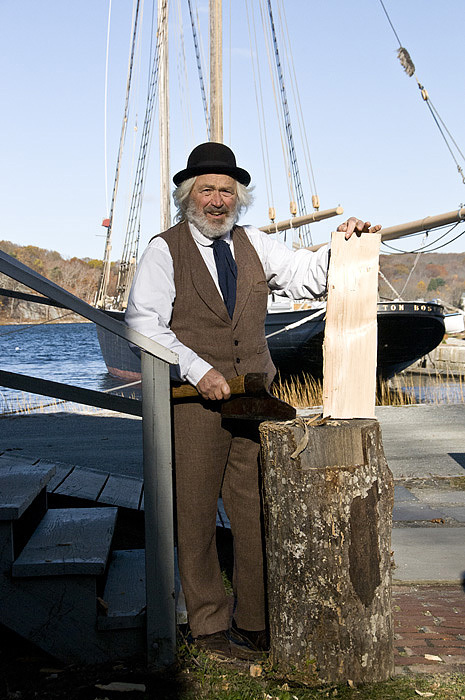 His reverence for wood resulted in a lifetime of coopering and ship-building, trades he hopes won’t disappear even in this age of progress. Ask Mr. Maxson about his seafaring youth, the yard at Oldfield, or modern woman Mrs. Vance! 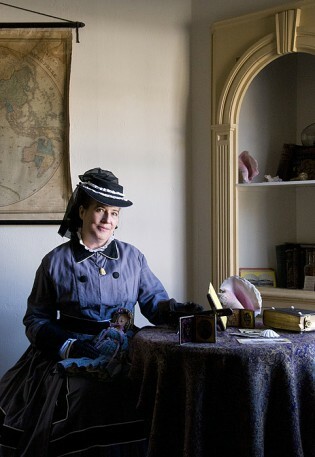 Mrs. Eliza Burrows Vance witnessed the Gold Rush and the taming of the West through her camera’s lens as one of the few professional female photographers in the world. Forthright and curious, she is just as determined to find adventure in Mystic as she was to cross the Isthmus of Panama on a mule in 1851. Ask Mrs. Vance about the Green Street School, her brother Ogden Hoffman, or fellow world traveler Mrs. Capt. Williams! As professional and educational opportunities for women blossom in the late19th century, so do opportunities for sports. In 1866 Vassar College was the first women’s school to institute two baseball clubs that played each other privately on school grounds. 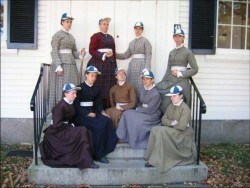 A photograph of the 1876 Vassar Resolutes inspired the Greenmanville Blue Stockings, a neighborhood baseball club that is occasionally seen practicing on the Village Green during the Museum’s warmer months.